SPECIAL: Save up to $350 on moving expenses for a limited time only! Huge 2 bedrooms located in the Creeks of River Ridge! Be sure to ask about deals for garage space, too! 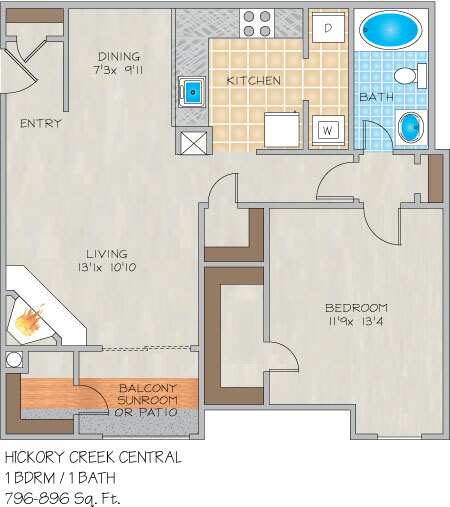 Please send me more information about Hickory Creek Central Apartments. Here are a few words to describe this wonderful River Ridge apartment community: elegance, comfort, convenience and classic design; that is Hickory Creek Central. The over-sized one and two bedroom garden apartments in River Ridge, LA come with an alarm system, fireplace, roman tub, full size washer/dryer, and many other designer touches. Cathedral ceilings, split level floor plans, private patios or sunrooms with faux-wood flooring are also available. For the best ultimate living experience in New Orleans area, Hickory Creek is the place! As soon as you step inside our gatehouse entrance, you are embraced by natural beauty and recreational possibilities. Our dynamic location in Elmwood Business Park places you close to the New Orleans, Metairie, and Westbank Central Business Districts. River Ridge is one of the newest suburbs of New Orleans and is home to many shopping and entertainment destinations. Our location is also ideal for individuals attending local universities such as Tulane, Loyola and Xavier. Located in The Creeks of River Ridge, convenient to everything, Hickory Creek has something to offer to everyone! If you are looking for an apartment for rent in River Ridge, come see for yourself. Extended Stay and Furnished Corporate Apartments Available With Flexible Lease Terms! 1 Pet (21 - 40 pounds full grown): $600 deposit of which $100 is non-refundable, plus a $25/month pet fee. 2 Pets (Maximum total weight, of both pets combined, 40 pounds full grown): $600 deposit. I have been living here for about a year and it has been a really great experience. Just the other day my roof began to leak slightly, I decided not to call the emergency maintenance since it was not a ferocious leak, and I submitted a work order at 8:30pm. Well during the night the leak began to worsen so I then decided to call the emergency maintenance line and the woman on the other end was incredible. I could not stay at home because of work but I did call the leasing office to see if anything had been done yet and the staff is amazing. They comforted me that the leak had been stopped and maintenance was working on getting my ceiling fixed. I work in construction so i understand that things can take their sweet time but they have been going through this process very fast. I am very pleased. Beautiful, and very well kept landscape. These Apartments are such a great steal for the price they’re going for! Love living in Elmwood. I have been at hickory Creek for a year now and it has been a positive experience. They made it an easy process for me with all of the leasing paperwork. Cassi is the absolute best! She has been so diligent in answering my questions in a very timely manner. While I was filling out the paperwork she was completely open to email and scans with all the forms. The apartment itself is a good size and has a good layout. When I first moved in my toilet had a leak and the maintenance staff came the very next day, I submitted the request after hours, to fix it. This is a great community and very safe location to move to. Very nice, clean, well kept apartments. Customer service is great as well. Every time I need to visit the office, or anytime I have a maintenance need. The employees here are ALWAYS very kind and are quick to take care of any situation I may have. I can't speak for anyone else, but my experience with Hickory Creek "Central" has always been a pleasant one to say the least!! Great place to live! If have a maintenance issue, they fix it right away and call after to make sure it went well! Great place!! I have lived at Hickory Creek for 3 years and had a great experience. I'm relocating to another state for a job and will miss this place. The apartment complex is extremely quiet compared to other places in the New Orleans metro area. Maintenance issues were resolved promptly and they have contractors on standby for issues that arise over the weekend. Denise is very friendly and I've never had any issues with the staff or maintenance personnel. They have all been professional during my 3 years here. There were never any issues with parking, even when I came home late at night. My electric bill was low compared to other apartment complexes. The apartment was very spacious and there are two utility closets for storage. Thank you Hickory Creek for 3 great years! Staff is always helpful & service has always been excellent. Wonderful people working here & great place to live. I lived there for 18 months, and I can say the apartment could have been nice. There were new floors and cabinets which were nice. My neighbors smoked, which even with maintenance sealing what they could, it still smelled. The ice maker never worked, even after they came to fix it multiple times. Dishwasher broke. Washer broke. The neighbors left trash everywhere, and even start smoking/chewing/spitting over the railing from the second floor to my front door. Cockroaches and earwig bugs were constantly coming from my neighbors apartment, even with pest control. The vents need a good cleaning. I had put a filter over all my vents and changed them every few months. They were covered in specs and very dirty. The only thing that was positive was that Denise and Ashley took care of everything I asked. Neighbors and bugs are truly what ruined it. This complex is awesome. Pools, fireplaces, nice staff, super on top of the living support and repair of anything that needs fixed, these people are one it. I’d 100% suggest them. It’s a nice place and it’s safe and secure. 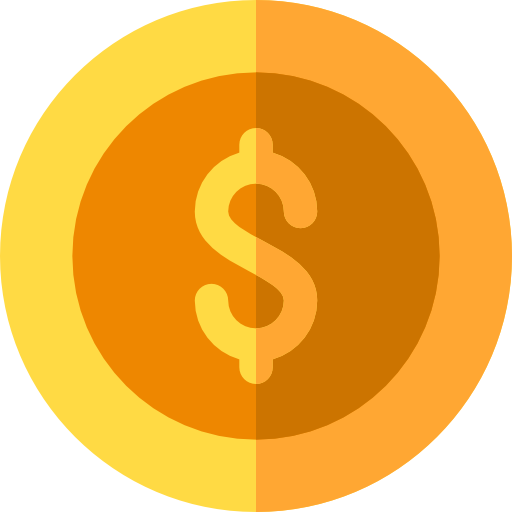 Price is very reasonable along with great perks. Check it out for sure. I've been here over 4 years and I've had nothing but good experiences. Denise has been a great manager and has checked in with me in the past to make sure everything is ok. It stays pretty quiet for the exception of a few neighbors over the years but nothing too crazy. I would definitely recommend to others about my great experience! I have lived at the Hickory Creek Apartments for almost 5 years. I love living here! The manager, office staff, and maintenance crew are the best! They are friendly, kind, helpful, and know their stuff. 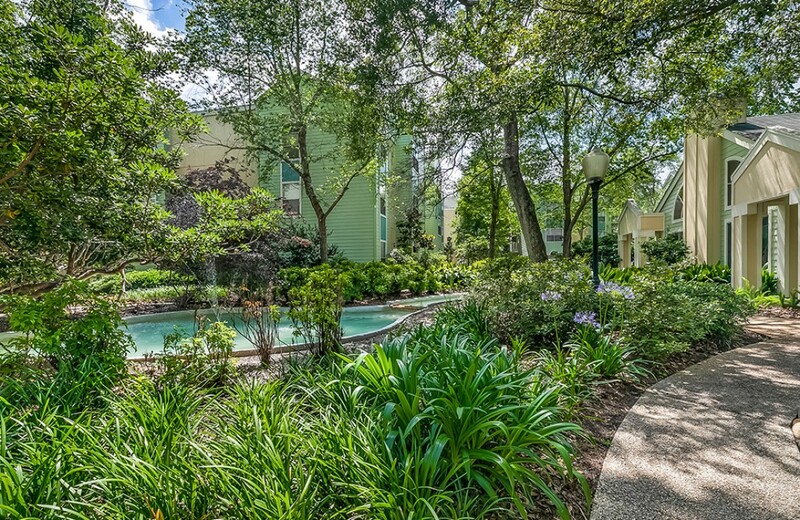 The area is quiet and... beautifully landscaped with a creek running in the center. It's also conveniently located to banks, groceries, restaurants, movies, fitness centers etc. Apartments are lovely with great amenities, such as ceiling fans, your own washer and dryer, fireplace, garbage disposal, ice maker, Roman tub, etc. They are also "pet friendly", so you don't have to give up your fur babies. Everyone here is very friendly, and there is a very diverse population. So if you're looking for a great place to live, come check out Hickory Creek Apartments! I have lived at the Hickory Creek Apartments for almost 5 years. I love living here! The manager, office staff, and maintenance crew are the best! They are friendly, kind, helpful, and know their stuff. The area is quiet and peaceful... beautifully landscaped with a creek running in the center. It's also conveniently located to banks, groceries, restaurants, movies, fitness centers etc. Apartments are lovely with great amenities, such as ceiling fans, your own washer and dryer, fireplace, garbage disposal, ice maker, Roman tub, etc. They are also "pet friendly", so you don't have to give up your fur babies. Everyone here is very friendly, and there is a very diverse population. 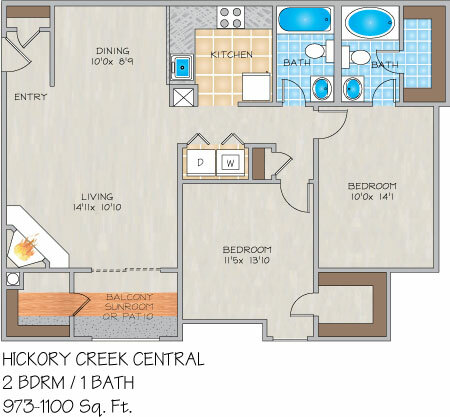 So if you're looking for a great place to live, come check out Hickory Creek Apartments!